Cary, NC – With St. Patrick’s Day this Saturday, now is a good time to learn how to make some traditional Irish dishes. Here is a recipe for Dublin Coddle, which is easy to make while still being bold and flavorful. Start by frying the sausages in butter in a frying pan. This step is optional but it is how it’d be served in Ireland. Once they’re fried, set them aside and get out a casserole dish. In the casserole dish, spread your chopped onions all across the base, then add sausages, barley and your bay leaf on top. Then on top of that, create a layer with your sliced potatoes. Pour in your stock and boil the pot. Once you’ve gotten to a boil, drop to low heat and let it simmer for 30 minutes. Afterwards, drop bits of butter onto each slice of potato. Then add in your salt and pepper and put the casserole dish in the oven, which should be preheated to 425 degrees Fahrenheit. Cook for 15 minutes or until the potatoes are a golden brown. 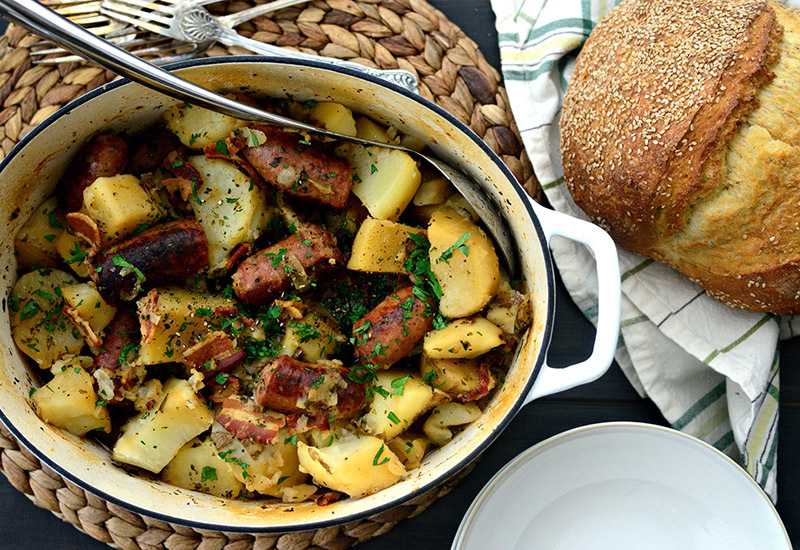 When it’s all done, ladle it out into bowls and pair with parsley and crusty bread. Taitneamh As! Story by staff reports. Photos courtesy of Simply Scratch.